Judging from current statistics, most of us have experienced allergies at one time in our lives. In fact, allergies are currently the reigning reason for visiting the emergency room in Canada today. More than 2.5 million Canadians (adults and children) suffer from asthma. Twenty percent report suffering from hay fever. These statistics point to the growing seriousness of allergies' impact on our health at any age. For parents, these statistics also underscore the urgency of providing clean indoor air for children to breathe. Now that a clear link between exposure to air pollution and health consequences for infants has been established (see more here), the urgency of ensuring clean, pure air is heightened correspondingly. 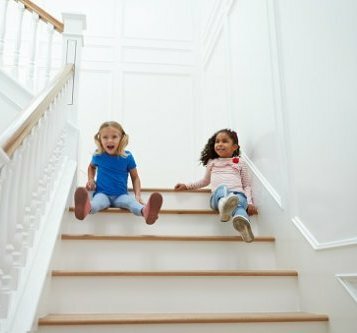 In this post, learn how to protect your children by taking steps to purify your indoor air. Different toxic air pollutants are linked to different health problems in infants. Some pollutants are known to be particularly dangerous when the mother is exposed while the infant is still in utero. Other pollutants hold the potential for damaging an infant's still-developing lungs following labor and delivery. Polycyclic aromatic hydrocarbons are air pollutants expressed as fossil fuels consumed for energy. The primary effect is neurotoxic, which means these pollutants have a direct negative impact on the central nervous system by damaging nerve tissue. Infants exposed to polycyclic aromatic hydrocarbons in utero or after delivery are at a higher risk of developing attention deficit hyperactivity disorder (ADHD). Black carbon, fine particulates, nitrous oxide, nitrogen dioxide can cause and exacerbate asthma. Each of these pollutants is strongly associated with traffic exhaust fumes. In a recent study at the University of British Columbia, results highlighted how exposure in utero to highway traffic fumes increases the risk of asthma. Specifically, mothers whose homes were geographically closer to highways had more infants who developed asthma before their fifth birthday (25 percent more). According to the Centers for Disease Control-Canada, a recent study proved that infants exposed to traffic related air pollution during the first 12 months post-delivery were shown to have a higher incidence of allergies than infants who breathed purer air. For parents, perhaps the scariest study, as reported by the National Institutes of Health (NIH) shows that infants exposed to toxic pollutants such as ozone and sulfur dioxide are more likely to experience sudden infant death syndrome (SIDS), low birth weight, abnormal lung development, premature birth, and other dangerous complications. Small size, intrauterine growth retardation, abnormal head size, birth length, and other complications were also reported as a result of infants' exposure to air pollution. As a parent, you may be reading about these studies and feeling hopeless — how can you ever expect to safeguard your children against ambient outdoor air pollution? The answer is that you can't. But you can have tremendous control over the quality of the air they are breathing inside your vehicle, your home, at school, and other indoor places they go. You can also control the quality of the indoor air you are breathing at work. An indoor air quality test will run quietly in the background in your workplace or home for 24 hours. The testing equipment will measure the levels of a wide variety of pollutants in the indoor air supply and deliver a comprehensive report that shows you what needs to be addressed. Results often include high levels of allergens (pet dander, mould spores, pollen, dust mites, etc. ), too-high levels of carbon monoxide and/or ozone, high levels of tobacco smoke or chemical fumes, high levels of pesticides/herbicides/insecticide, and other pollutants commonly found in a work or household setting. An indoor air duct cleaning is the best way to remove the most toxins in the least time. It is like rebooting a smart device — but you are rebooting the freshness and purity of your indoor air supply instead. During the cleaning, your air duct system will be cleared and cleaned of all dust, debris, and toxins, which will prevent any detected toxins from getting reintroduced to your indoor air supply in the future. Dryer vent cleaning is nearly always recommended in concert with an indoor air duct cleaning to ensure deeply stored pollutants in the back ducts of your clothes dryer are removed. HEPA (high-efficiency particulate arresting) filters are currently the sole option equipped to block up to 99.97 percent of small particulate matter — meaning the toxins that are so tiny, they can penetrate skin and tissue and get all the way into the innermost systems in the human body. You can opt for central or portable filtration or use HEPA-rated filters. Here at Clean Air Solutions Hamilton, we are a third-generation, family-owned and -operated business. So we are parents first, professionals second. If you need help purifying your indoor air at home or at work, contact us at 905-544-2470 or online.